So you have a mosquito problem? Swatting a few mosquitoes simply will not do the trick, neither will a mosquito beeper. Letting masses of beneficial insects die in a light trap just to destroy a handful of mosquitoes, does not help much either. Solving the problem is actually quite simple: You need the right capture performance to combat mosquitoes effectively. A significant share must be withdrawn regularly from the mosquito population. Thus, the population will shrink, and less offspring will be produced. Only then you will get a control effect on the mosquito bite pressure on your patio. Biogents’ mosquito traps do have the right capture performance. Mosquitoes are attracted to them in almost the same way they are attracted to a human. This means that mosquitoes would still decide in favor of a human being if given the choice. Unfortunately, no one has come up yet with a trap that is more attractive than a human. The effect of Biogents traps consists in luring mosquitoes from the surrounding area, and removing them round the clock. You can check the capture rate any time by glancing into the trap bag and counting the mosquitoes that will no longer bite you. The radius covered by the trap is a maximum of 20 meters. Accordingly, you do not need to worry about additional mosquitoes from a greater distance being drawn into your garden. We measured the effect of our traps. We checked gardens together with health authorities and mosquito control organisations to find out whether test persons were bitten less with Biogents mosquito traps. Figure: The effect of Biogents traps on the bite rates in three test zones in Cesena, Italy, compared to three zones without traps. Source: Englbrecht C., Gordon S., Venturelli C., Rose A., and Geier M. (2015). Evaluation of BG-Sentinel Trap as a Management Tool to Reduce Aedes albopictus Nuisance in an Urban Environment in Italy, Journal of the American Mosquito Control Association, 31(1):16-25. A measurable decrease in the frequency of bites in gardens was already evident within a few days with Biogents traps. 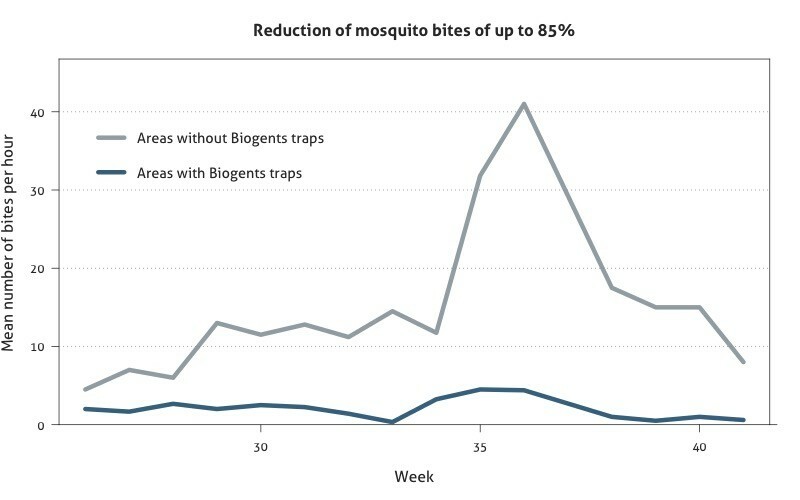 A 85 % decrease in mosquito bites compared to control gardens without traps was even achieved in the course of the season – without the use of insecticides. However, it will never be possible to achieve 100 % protection against mosquito bites outdoors. Degener, C.M., Eiras, A.E., Azara, T.M.F., Roque, R.A., Rösner, S., Codeço, C.T., Nobre, A.A., Rocha, E.S.O., Kroon, E.G., Ohly, J.J., Geier M. (2014). Evaluation of the effectiveness of mass trapping with BG-sentinel traps for dengue vector control: a cluster randomized controlled trial in Manaus, Brazil. J. Med. Entomol. 51, 408–420.